Cut vegetables into a variety of sizes and shapes depending on their intended use. Focus closely on their work, striving to improve with each iteration. Prepare aesthetically pleasing presentations of food. Cut carrots and cucumbers in a julienne for use in maki sushi. Apply the principle of kodawari to their work and make incremental improvements to their knife skills. Practice laying out their ingredients with a focus on beauty. Copy the Maki Sushi recipe to hand out. Today we are going to make Maki Sushi. I know some of you may be wondering how we can make sushi without using any fish or shellfish. We are going to make some delicious vegetable and egg sushi. Egg sushi, or tamago (yaki), is one of the most important types of sushi. It is a rolled or folded omelette that is then sliced and served in sushi. It is traditionally used as a test of a sushi chef’s ability. If a sushi enthusiast goes to a new sushi restaurant, they might order one order of the tamago to see how the chef prepares it. If it is good, they will stay for a whole meal; if not, they would pay and leave to find another place to eat. Today’s areas of focus are beauty and focus. We are going to dive into focus through looking at the Japanese principle of kodawari. Kodawari is the relentless and uncompromising pursuit of perfection, complete devotion to a mastering a craft. To practice kodawari is to have complete focus on your work. This practice of kodawari can be applied to any activity, craft, hobby, or type of work. Today I am asking you to try to practice kodawari in your work today as we prepare Maki Sushi. I don’t expect you to master the skills we are going to practice today, but I think you may be surprised at how much you can improve if you focus closely on your work. 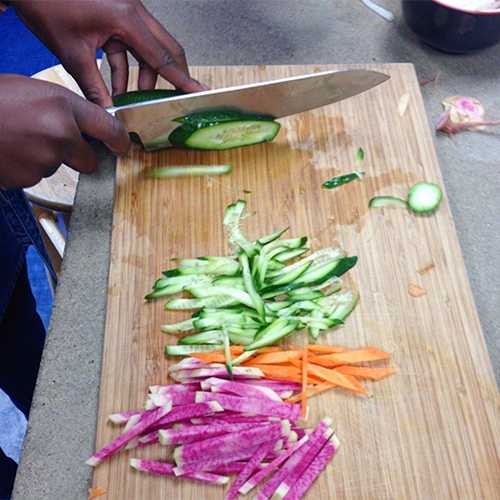 In your small group, your teacher will demonstrate how to cut on an angle and how to julienne vegetables. Some of you may have tried this before in the udon lesson. If you are doing it again, work to improve upon your technique.. You are doing this for yourself, not to impress others. You are doing this because you can get better by focusing. When you are done cutting or preparing your ingredient, take time to lay it out in a beautiful way so that our food can be the centerpiece of our table today. Your care and focus will come through in the food that you prepare. When you are eating, look for this care and focus in things that others have prepared. See if any students have questions about sushi, kodawari, the knife, or Mr. Takeda. Small-group check-in: What is something you do where you get very focused? This could be a sport, a hobby, reading, or school work. Introduce jobs for the day in more detail. Demonstrate how to julienne and cut on a bias. Eat. Circle back to the students’ answers to the check-in question and learn more about their pursuits in which they find great focus. If there’s time, reflect on discussion from the small table groups. Encourage students to continue reflecting on the idea of kodawari. Cherished object: Bringing in a physical object for chef meeting really grabs students’ attention. Kodawari: Introducing the specific concept of kodawari in the chef meeting for this lesson was new this year. We were captured by the sense of pride in work and attention to detail it seemed to inspire in many students. Julienning: Some students were intimidated by the precision required for a julienne cut. When introducing it, we often shared that this was a technique that would be difficult to get at first—they shouldn’t expect to be successful the first time they try it. However, if they continue to work on it over the course of the class period, they will improve very rapidly and may be surprised by the mastery they’ll be able to develop by the end of class. Raw food: We liked to remind students to prioritize hygiene in this lesson by frequently washing their hands because we would all be eating the food raw. Varying cuts: Encourage students to try multiple cutting techniques in this lesson, including dicing, slicing, julienning, grating, and chopping or mincing. Nori: Share with students that nori is dried seaweed. Some students with sushi-making experience were disappointed at first to find out that we weren’t rolling long sushi rolls and instead cutting nori sheets into quarters. We explained that this way you can add more toppings and try multiple different combinations. Egg techniques: This was the third consecutive lesson in which our students cooked eggs using a different technique (the first was tortilla scramble and the second was soft-boiled egg for udon noodle soup). Asking students which egg-cooking technique was their favorite, and also whether they have special ways of making eggs at home, can make for good conversation at the table. Cooking the eggs: We cooked the rolled omelette on a griddle at about 375F. It could also be made in a heated pan on medium. Vinegar smell: Many students were shocked by the smell of the vinegar heating up for the rice dressing. We warned students that it would have a pungent smell, but assured them that this was the typical way to make a sushi rice dressing. Bringing it home: Asking students if they practice kodawari in any activities in their daily life can be a great conversation. Food as the centerpiece: When setting the table, we encouraged students to think about presentation and to lay the sushi fillings out beautifully. Many students were very excited to do this. Pacing: Encourage students to think about quantities for everyone’s fourth rolls when taking rice and toppings for the first.